The diameter of a grapefruit, depending on its variety, can range between four and six inches. Its albedo (the white matter under the skin) is about a quarter to half an inch thick. The fruit’s skin looks like that of an orange, but its flesh comes in white, pink or red. It is called a grapefruit simply because it grows in clusters, like grapes. 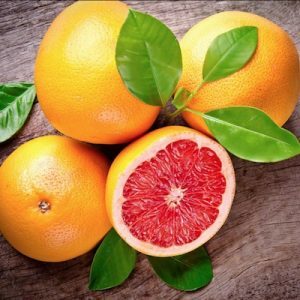 The taste of a grapefruit can be bitter and sour but it has so many health benefits. Grapefruit doesn’t only contain vitamin C which is commonly known to be protective against cold or flu. It is not just one nutrient that helps prevent a certain disease, but rather the combination of several nutrients in it that does the trick. This is the kind of nutritional power that we can find only in the way that Nature provides in our natural food. This juicy fruit contains citric acid, natural sugars, essential oils like limonene, pinene and citral. It has high amounts of vitamin C, and smaller amounts of vitamin A, B complex, E and K.
In the mineral department, larger amounts of calcium, folate, phosphorus, and potassium are found. The nutritive phytonutrients of this voluptuous fruit—liminoids, flavonoids, lycopene and glucarates—help fight cancer and various diseases. When eating or juicing grapefruit, peel off the skin but leave some of the albedo intact as possible as it contains the highest amount of valuable bioflavonoids and other anti-cancer agents. Bioflavonoids will superboost the nutrients contained in grapefruit. Common cold: A common cold is usually your body telling you that you are overworked. A regular drink of grapefruit during a stressful period gives your immune system the boost needed to prevent it coming on full-blown. Cholesterol: A certain compound found in grapefruit helps reduce the excessive production of cholesterol from the liver. Diabetes: Diabetics can safely eat grapefruits. In fact, consumption of this fruit will help reduce the starches and sweets in the system. 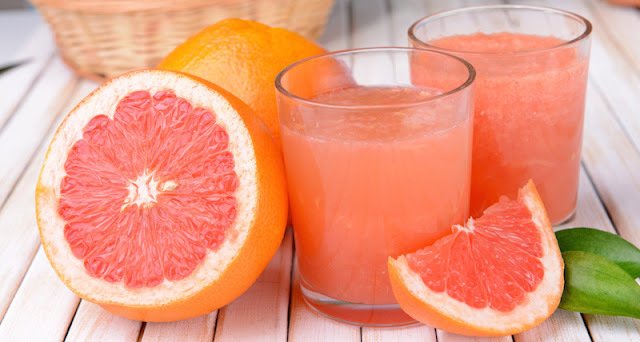 If you are diabetic or borderline diabetic, drink grapefruit juice to help lower blood sugar levels, naturally. Digestive disorder: This juice helps to promote digestion by increasing the flow of gastric juices. Eat the fruit together with its albedo and pith for their extra fiber that aids bowel movements. Fever: Besides drinking plenty of fluids, also drink grapefruit juice to reduce fever. Insomnia: A drink of grapefruit juice before bedtime, helps to promote sleep and alleviates insomnia. Pregnant woman: The bioflavonoids and vitamin C help to reduce water retention and swelling of the legs during pregnancy. Sore throat: Drinking a freshly-squeezed grapefruit juice helps relieve sore throats and soothes coughs. Stomach and pancreatic cancer: The anti-cancer agents in grapefruit (especially in the albedo) are particularly protective against these cancers in the digestive system. Weight-loss: This fruit has a fat-burning enzyme and can help to absorb and reduce the starch and sugar in the body. It is widely consumed by people who are trying to lose weight. If you don’t fall under the category of people mentioned below (look at “Caution” colum), then take a glass of grapefruit juice twice a day and eat normally. It is even helpful for getting rid of cellulites from the inside out! Choose grapefruits like how you would oranges—firm and springy to the touch. If you can, choose the pink and red variety which are slightly sweeter. Keep grapefruits at room temperature before juicing to get the most out of it. To prepare, quarter the fruit and peel off the skin. If you find grapefruit juice too bitter or sour, here’s suggestion of one of my favorite combos that makes it so delicious. Grapefruit contains high levels of flavonoid naringin that will reject synthetic man-made drugs. This is beneficial for our human cells because it helps to recognize alien compounds which should not be in our body, therefore, are treated as toxins. The presence of grapefruits may halt the metabolism of these drugs, leaving the drugs in your body thus creating the risk of toxic poisoning. Doctors may tell you that grapefruit is the cause of the toxicity, but in fact, it is really the drugs that is causing the toxicity. If you are not under medication, grapefruit juice can do a world of good. However, despite all its goodness, always remember to take only in moderation.